Expressions of Interest for SRCWA Have a Go Day 2019 a Live Lighter Event now open. - Seniors Recreation Council of WA Inc. Expressions of Interest for Have a Go Day 2019 a Live Lighter Event are now open. 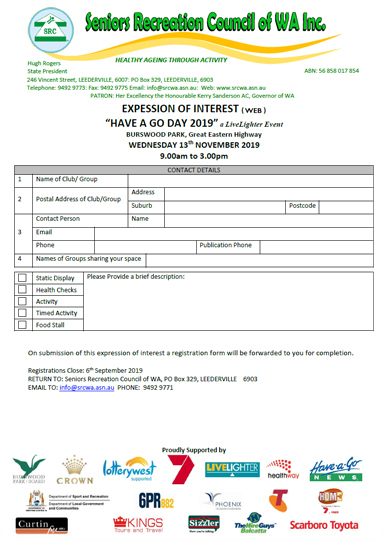 Please fill and return the Expression of Interest form including Terms and Conditions (below) to be placed on our mailing list for Seniors Recreation Council of WA’s “Have a Go Day 2019 a LiveLighter Event. Should you have any questions please contact the SRCWA office on 08 9492 9773.